Amy is trapped in a quarantine facility for victims of an alien plague – a plague that will kill the Doctor in a day – as the time-travelling drama continues. 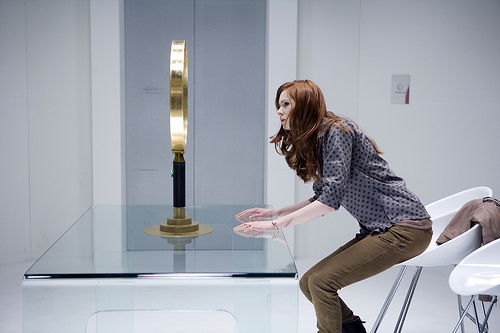 The Doctor can use the TARDIS to smash through time and break in, but then Rory is on his own. He must find Amy and bring her back to the TARDIS before the alien doctors can administer their medicine. Rory is about to encounter a very different side to his wife. Can he rescue Amy before she is killed by kindness? Amy is played by Karen Gillan, The Doctor by Matt Smith and Rory by Arthur Darvill. I thought it was incredible - first I've rewatched the same night it aired since The Doctor's Wife. Waaaaaaaaaaaaaaaaaaaaaaaaaaaaaaaaaaaaaaaaaaaaaaaaaaaaaaaaaay better than last week.